WHAT: Shahjahanabad, the 7th city of Delhi built by the Mughal Emperor Shahjahan was the culmination of a long-cherished dream of Emperor Shahjahan to create the world’s best city in India. His reign saw the greatest advancements in Mughal Architecture and the creation of the new Mughal Imperial Capital of Hindoostan on the banks of the River Yamuna alongwith the royal palace and fort, Qila-e-Mubarak better known as Lal Qilla or the Red Fort took almost 15 years. As the city of Shahjahanabad with its grand markets, havelis, palaces, gardens, streets and avenues began flourishing, it was the grandeur of Lal Quilla which sparkled as the proverbial ‘jewel’ in the ‘crown’ of the city of Shahjahanabad! ATTRACTIONS: After a sumptuous breakfast in the oldest and most famous market of Shahjahanabad, Chandni Chowk, we shall enter the realm of the Quila-e-Mubarak. 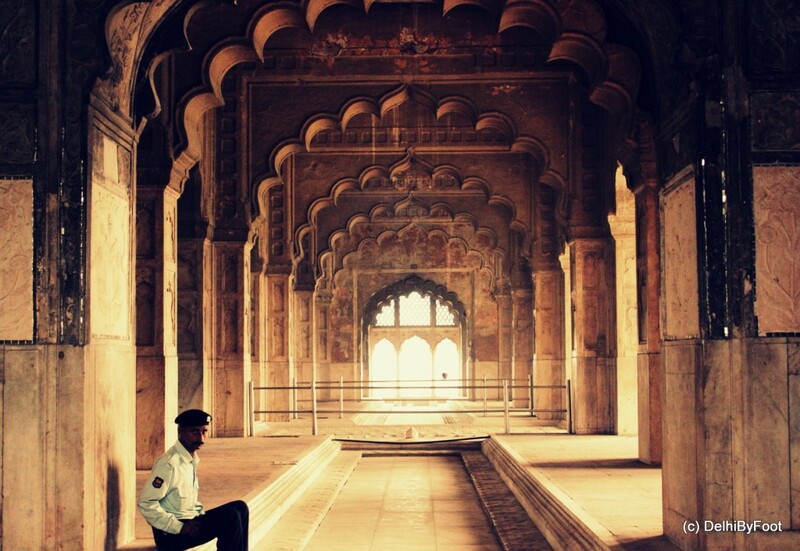 Listening about the history and stories of this amazing monument will help you get a fascinating glimpse of Mughal court life inside the Fort and help you imagine the richness of the Mughal royal lifestyle at the height of its power over the subcontinent. Feel the aura of the fort as the ultimate seat of power as it must have exuded nearly 450 years ago. We will visit the public and private audience halls, the women’s quarters, the private residences, baths and gardens of the Mughal emperors. The fort was home to a succession of Mughal emperors, but as the glory years of the Mughals came to an end so did the royal lifestyle! Later Emperors abused the fine buildings, invading raiders snatched its various treasures and finally the British, blind to its qualities, pulled down the greater part of this grand fort. We will also visit the smaller Salimgarh Fort which was constructed on an island of river Yamuna pre-dating the Red Fort by almost 120 yrs. Later several Mughal rulers camped here which includes Humayun who stayed here for three days before recapturing Delhi in 1555AD. In later centuries the Mughals and British (after 1857) used it as a prison for political prisoners including many Freedom Fighters till as late as the 1940s. DURATION & TOTAL WALKING DISTANCE: 4.5 Hours, 3.5 Km in a loop. 1- Do wear a good pair of walking shoes or comfortable flip-flops. 1- Bi-Lingual exploration leaders and facilitators.